Xabier Salaberria works through and recombines syntaxes of sculpture, architecture, and industrial design. He explores processes of formalization, as well as the potentials of artistic media to become something else given their shifting material, ideological, and institutional contexts. Oscillating between signs and materials, art and something other than art, his works open up to contemplation as displaced or intransigent objects and situations. A kind of vanishing point for what objects normally are and the norms they uphold, Salaberria’s works question their time and place in history. At the Ciccillo Matarazzo Pavilion, the venue that has housed the Bienal de São Paulo since 1957, the artist explores the relationships between the building’s architecture and the reality of its surroundings, while mobilizing local elements of the city of São Paulo and the history of the Bienal itself. 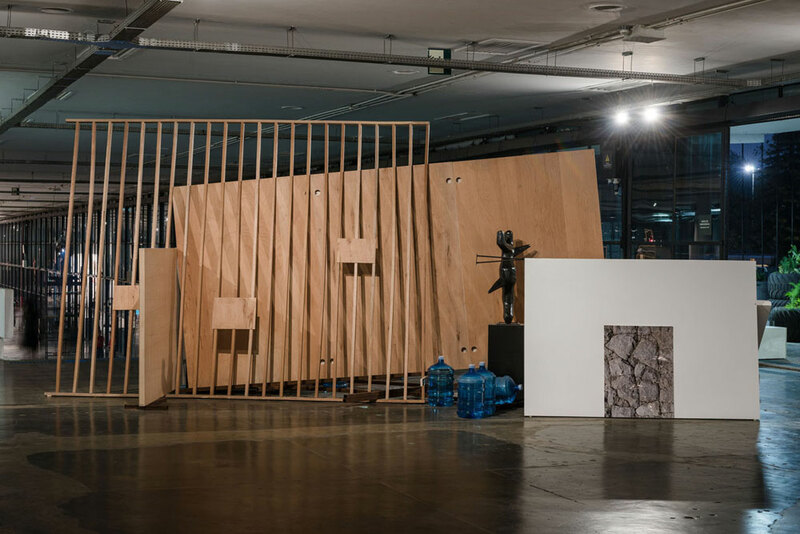 The installation Restos materiales, obstaculos y herramientas [Material Remains, Obstacles and Tools] (2016), deals with what Salaberria defines as the ‘abstract materiality’ of objects, which conditions and alters people’s circulation in the space, yielding unexpected connections between visitors, objects and the site. Images and elements of different natures seek to expand the exhibition context, stretching the limits of the exhibition room towards the city and the streets.